Well since last Wednesday afternoon we've had the house all to ourselves! It's been so lovely!! The place is finally looking spotless again and running much more smoothly. I've actually had dinner cooked before Jeremy has gotten home (at 4:30!!) 3 times in the last week!! I am starting to feel like i've finally gotten the hang of this 'mother' business. I'm sure i'm just having a 'good time' at the moment, and reality will hit again soon. I have just been feeling that since Calvin turned 1, everything has been so much easier though. It's probably because we're all feeling so much more settled in our new house. It's been quite wet ever since about last Thursday. Our backyard was starting to look a bit like a pond yesterday!! It has started to clear up today though so i hope there's not too much more. It would be nice to be able to get some washing on the line and give our backyard a chance to dry up a bit!! Our weekend with just our little family was lovely. We went to IKEA on Saturday and Bunnings on Sunday. I found a hall table for our foyer, but it's not coming in until November. Not to worry. It's a good price and it fits the bill perfectly! Just have to be patient. Jeremy put our TV up on the wall in our living room on Sunday and it looks fantastic! Now we just have to fix up all of the cords and maybe put some pot plants around to hide the powerpoints at the base. 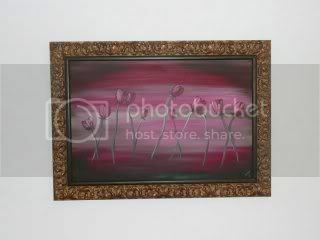 Last Friday night i went to the moolighting crop at Scrapbooks etc in Underwood. I managed to get 3 pages done and a couple of cards. 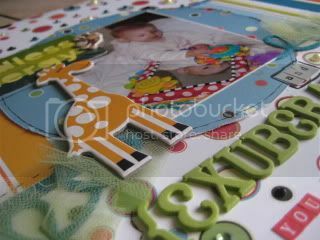 It wasn't what i was planning on scrapping when i left the house though - i had just gotten a bunch of photos from Calvin's birthday printed but i left them at home!!! Nevermind, i had a pack of old photos in my pack so i scrapped them instead. It actually made me do a page about myself for the first time since i've had Calvin!!!! 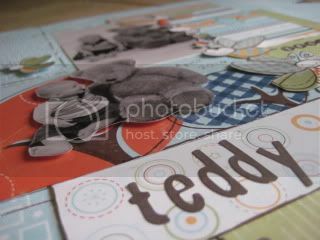 I did 2 pages for ScrapBoutique October challenges. The first is a page that i LOVE!!!! The challenge was to do a page about what i'm proud of about myself - not what i've done but who i am. It was a bit tough, but i managed it OK. This is one of my favourite photos of me, so i'm glad that i had a chance to scrap it. 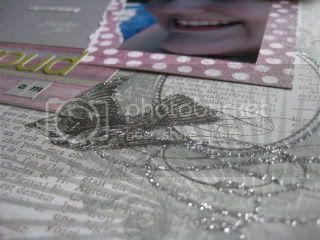 I just love the flowers (Prima) and the gorgeous glitter on the papers! 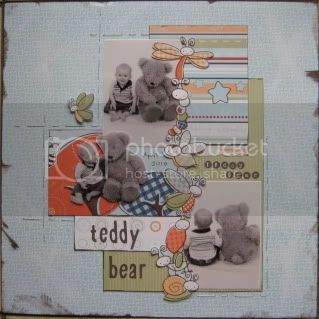 The second page i did for a Scrapboutique challenge i'm not so sure i like. Every now and then i do a page that i don't really like, but i think that's all part of learning and growing as a scrapper. 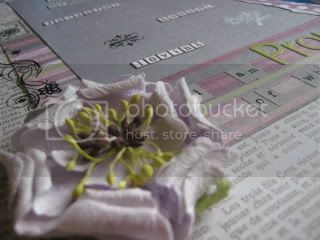 I'm never 'ashamed' of my scrapping, but i do try to learn from my mistakes. I think i have used too much PP on this one (i'm always very heavy on with the PP, but this is overboard i think!!) 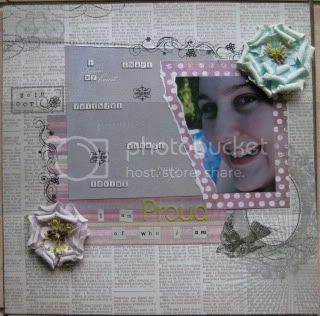 and i just didn't know where to stop with the embellishments - way too much going on on this page. It kinda reflects what the page is about though - Calvin is a busy boy, and it's a busy page!!! 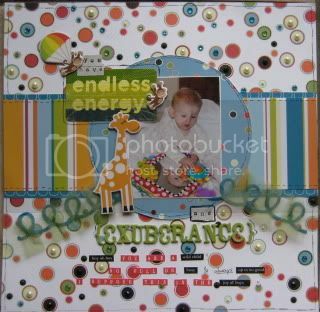 The final page i did on Friday night was based on a sketch by Peta McBeth of Scrapbooking From Scratch and i LOVE this one too!! These photos are from Calvin's 6 month old photo shoot at Pixiphotos. I just love these photos of Calvin with this gorgeous bear that's as big as him. So cute!! I'm heading to my local shop this Friday night for the first time. It's called Fancy That Scrapbooking and it's in walking distance to our new house!!! I can't believe how much i love this new place :) They are actually having a blog giveaway at the moment, so check out their blog if you would like to win a pack of christmas papers and embellies!! It will be great to meet some new happy scrappy ladies a bit closer to home!! good to hear that things are settling down well for you! You are so lucky to have a LSS in walking distance! !